After serving 10 years as The Peregrine Fund’s President and CEO, J. Peter Jenny retired in June of 2016. Pete has been associated with The Peregrine Fund since the organization's beginning. In 1970 he accompanied one of the founding directors, Robert Berry, to the eastern Canadian Arctic to collect some of the first Peregrine Falcons to be used for captive breeding. Once captive breeding was successful, Peter worked at one of the early release sites on the Susquehanna River in Pennsylvania. After graduating from the University of Montana with a Bachelors degree in Zoology, Peter pioneered The Peregrine Fund’s involvement in the Neotropics with his research on the rare Orange-breasted Falcon and subsequently co-founded the Maya Project with Bill Burnham. 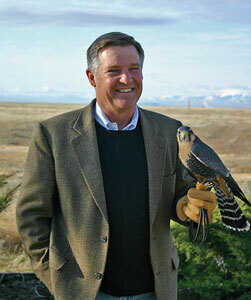 During his 18-year tenure as The Peregrine Fund's Vice President, Peter divided his time between managing the Northern Aplomado Falcon Restoration project and program development. Peter remains an active falconer and private pilot and enjoys a variety of field sports including bird hunting and fly-fishing. Peter’s long history with the organization, passion for wildlife and conservation, and personable nature serves him well as President of The Peregrine Fund.